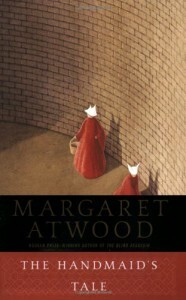 The Handmaid's Tale - Becca's Book Bonanza! And yeah, I completely agree that it was enraging how cool with everything her husband seemed. "Ohhh we'll get through it together!" Um, no? But at the same time, I don't feel like the main character really seemed too bothered by it either. Sure she seemed irritated and depressed she couldn't work any more, but there was no fight in her at all! I really enjoyed how the story was told. Going back and forth and revealing small bits of information at a time was fun for me. It was like a puzzle where I was given one piece at a time and needing to slowly put it all together to get the full picture. I was very intrigued to find out more information the entire way through. I would give this a 3.5. I enjoyed it but it wasn't one of my all-time favorites. And one of the things that is needed for me to give a book a 5/5 is for me to fall in love with the characters. There were no characters that I loved at all in this story, so that was the drawback for me.